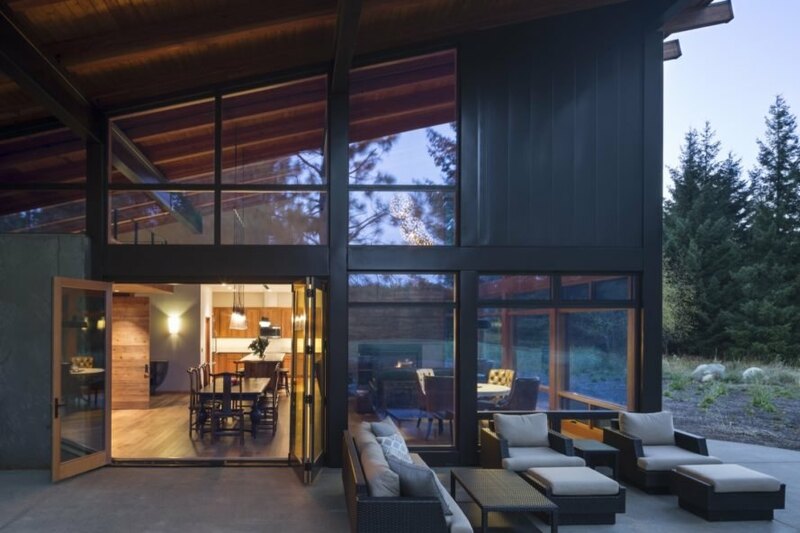 Nestled in a historic mining area in Washington State’s Cascade Mountains, a holiday retreat offers luxurious comfort without compromising sustainability targets. 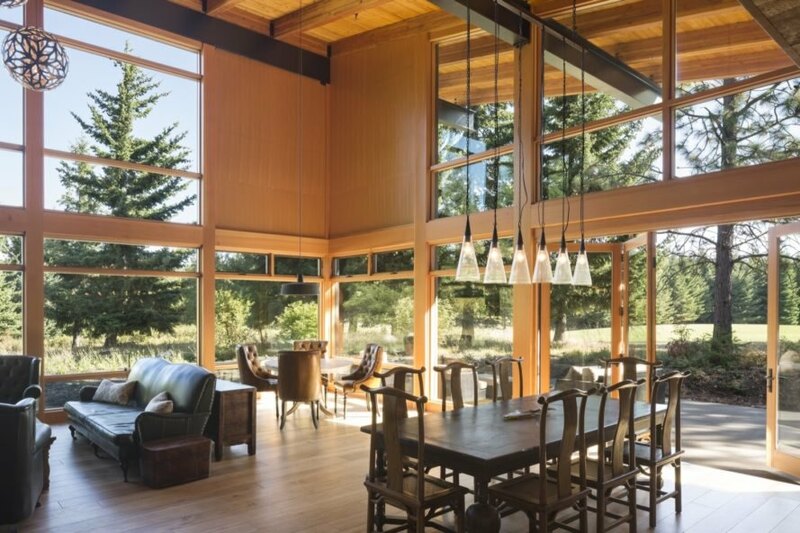 Despite the region’s freezing cold winters and extremely hot summers, Bainbridge Island-based Coates Design Architects crafted the Tumble Creek Cabin to net-zero energy standards using renewable energy and passive solar strategies, rather than traditional energy consumptive cooling and heating systems. Powered by solar energy, the energy-efficient cabin boasts a contemporary design with an abundance of full-height glazing to look out on the landscape beyond. 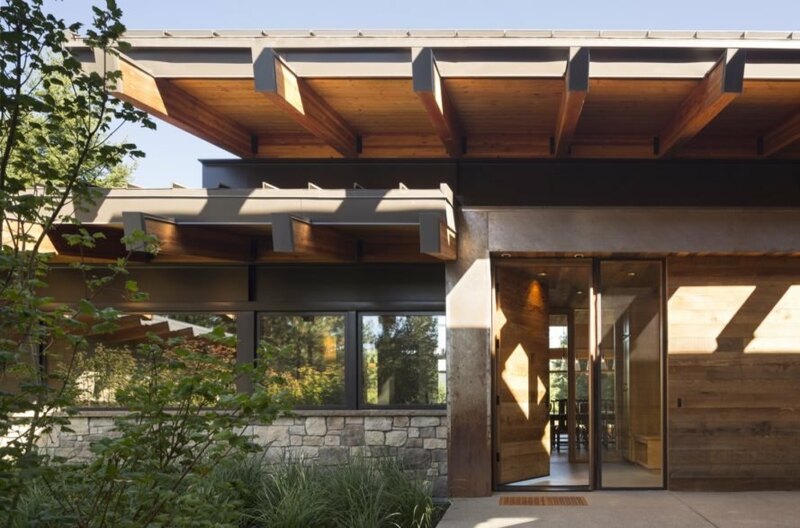 With a natural palette designed to evoke the region’s mining history, the 3,835-square-foot Tumble Creek Cabin is mainly built of stone, Corten steel and reclaimed barn wood. The steel and timber elements are left exposed throughout, while floor-to-ceiling glazing establishes strong connections with the outdoors. 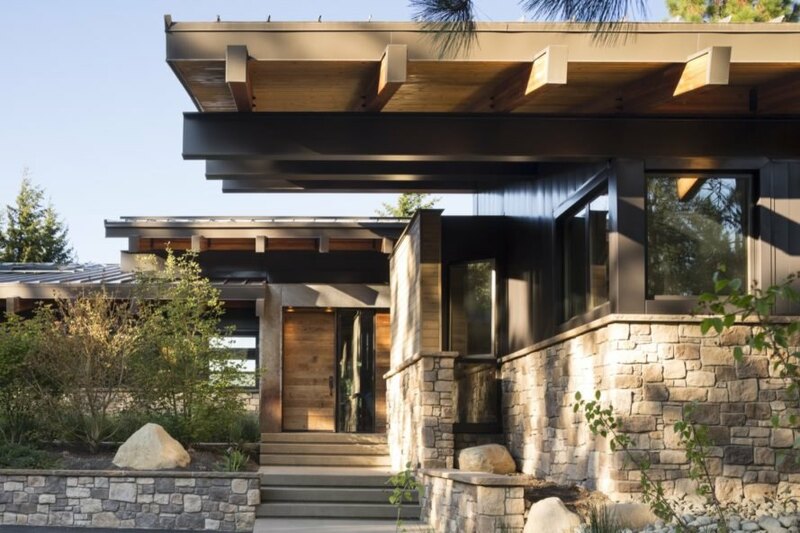 To minimize the home’s energy usage, Coates Design Architects oriented the home to follow passive solar principles and mapped the interior layout to conserve energy as much as possible. The self-contained entry vestibule and mud room, for instance, doubles as an air lock to stop chilly drafts and unwanted hot air from entering the main living spaces. Designed as “a legacy piece” for the clients’ extended family, the vacation home includes two primary bedroom suites and a bunk room in the main residence, and an additional guest room can be found in the separate extension. 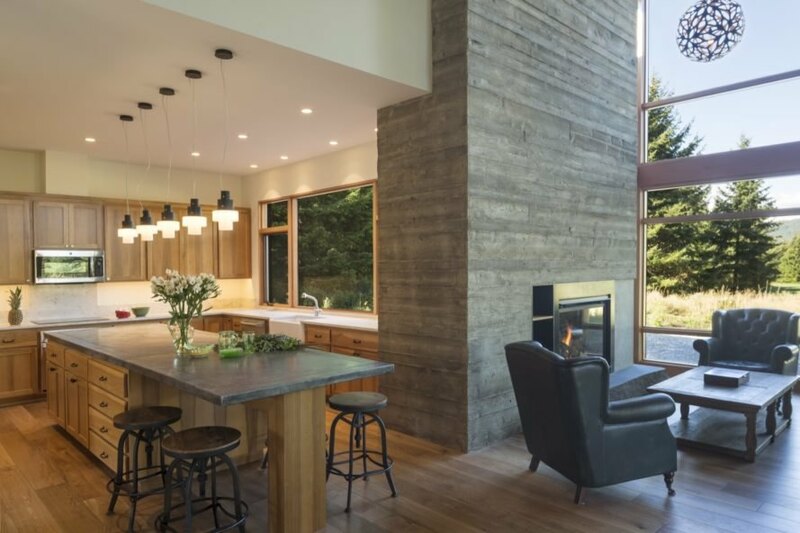 An L-shaped open-plan great room on the east side of the main house is anchored by a massive board-formed concrete fireplace and opens up to a spacious patio. A winding outdoor walkway leads from the patio to an outdoor spa and a freestanding garage on the southwest side of the site. In addition to a 10 kWh photovoltaic array on the roof, the cabin relies on radiant underfloor heating and an energy recovery ventilation system; both systems can be monitored and adjusted remotely. Energy-efficient aluminum-clad wood windows and doors were installed, as is a Tesla Powerwall for electric vehicle charging. From the hottest summer days to the coldest, snowiest winter nights, this cabin in Washington hits net-zero targets. 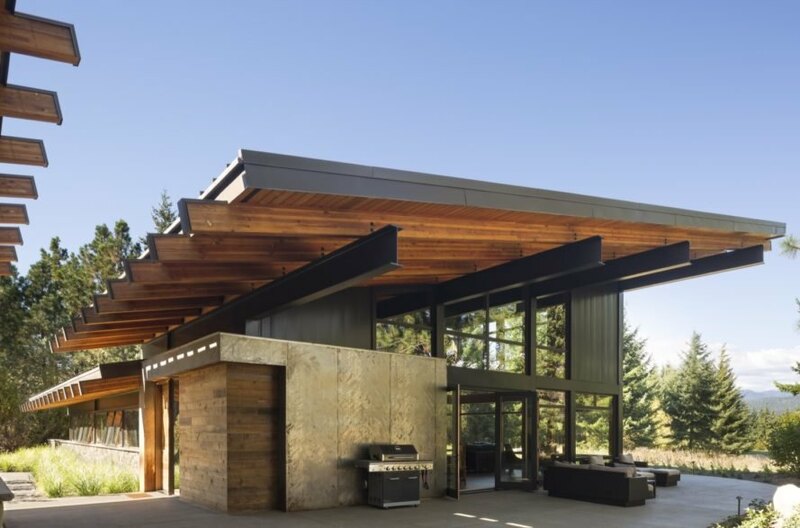 Coates Design Architects used passive solar and renewable energy systems to make the cabin energy-efficient. Inside or out, residents can enjoy outstanding views. The entry vestibule serves as an air lock, preventing drafts of cold air or a wave of heat from entering the home. A combination of an open-floor plan, tall ceilings and large windows makes the great room feel spacious and airy. The vacation house boats exteriors wrapped in stone, reclaimed wood and weathered steel to reference the site's mining history. In cooler weather, residents can warm up by the fire. The home is oriented to optimize passive solar principles. The spacious outdoor patio is perfect for entertaining.